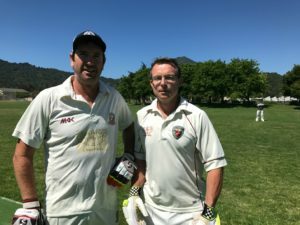 Four matches into the 2018 season and the Napa Valley Cricket Club (NVCC) are still looking for their first victory, having lost all of their matches to date on the road. Early season pressure on their home ground facility at the Napa Valley Expo in downtown Napa means that each season the NVCC has to schedule their early season matches away from home. 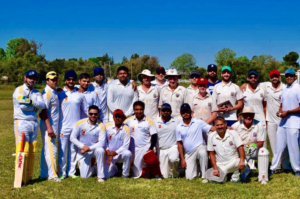 In their season opener a strong Napa Valley team traveled to Bradshaw CC on the grounds of the Gurdwara Sacramento Sikh Society, just south of Sacramento. Bradshaw batted first and the strength of their team showed as the opening pair made light work of NVCC’s opening bowlers, Adersh Maqsood and Bernie Peacock, by putting on 32 runs for the first wicket in only 5.4 overs. 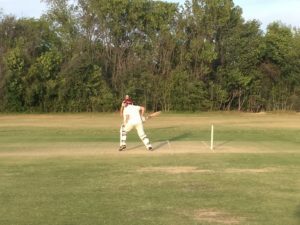 A stunning direct-hit run-out by American NVCC member Tyler Nethaway did nothing to stem the flow of runs as Bradshaw continued to pile them on. The match was ultimately swung in Bradshaw’s favor by a fine innings from Gaurav who hit an impressive 73 runs off just 41 balls that included six fours and four sixes. Alongside fellow batsman Subhash the pair notched up 101 runs for the fifth wicket. Highlights in the field for NVCC included more excellent fielding from Nethaway with three catches and two catches from new member Sorabh Das. Three wickets for Harjit Singh helped curb the flow of Bradshaw runs but not before they had posted a formidable innings total of 238 runs in 34.5 of their 35 overs. Lunch at the Sikh Temple was both a cultural and culinary experience for the NVCC team and an insight into the Sikh faith for many. NVCC were in trouble right from the start of the chase with runs hard to come by and wickets falling at regular intervals. Sanjeev Joshua (2 runs off 13 balls), Martin Mackenzie (9 off 29), Jason Beveridge (3 off 14), and Leigh Ritchie (4 off 9) weren’t able to stick around for long enough to make any impression. The first sign of a fight from NVCC came when Das (36 off 35) came together in the middle with Singh (16 off 15), and then Brendan Helme (11 off 27) before they were dismissed. A quick-fire 12 off 16 from Maqsood helped to add some respectability to the NVCC total as they eventually made it to 130 runs having batted for 27.3 overs. 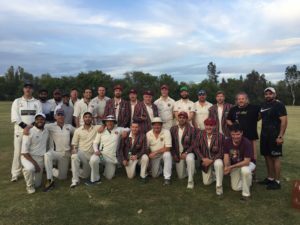 The second match of 2018 for the NVCC was at the expansive Arroyo Park in Davis against the Sri Lanka Lions. The Lions batted first and were in trouble early on thanks to some great line-and-length bowling from Maqsood and Karan Grewal. Grewal was rewarded with the first of his three wickets on the day with this fifth ball caught by Maqsood. Grewal also accounted for the other Lions opener, Gihan, in the sixth over, while the Lions’ Indika was slowly building a patient innings that halted the flow of early wickets. He would go on to amass 29 runs off 35 balls. Tail-ender Yohan tonked the NVCC bowlers for 39 runs off just 26 balls and that included three fours and two sixes to drag the Lions to a total of 171 runs in their 30 overs. As was the case at Bradshaw the NVCC openers failed to stick it out with both batsmen gone inside three overs. With Abhijit “Doc” Adhye (0 off 4) and Joshua (2 off 5 retired) along with new member Vinay Madavan (3 off 7) all falling early, NVCC needed someone to put down anchor. That was done with a great third-wicket partnership of 55 runs by Grewal and Singh who dragged NVCC back into the match with two watchful innings. Grewal in particular had a fine knock of 67 runs of 72 balls which included three fours and four sixes. He almost single-handedly won the match for NVCC but couldn’t find support from the lower order batsman who came and went all too cheaply. NVCC ended up with a total of 149 runs falling short in the 28th over. NVCC toured to Los Angeles for their third match of 2018 and were lucky enough to play on the hallowed turf at Woodley Park in Van Nuys. “Woodley” as it’s known in the cricketing community is a true gem of a cricket facility not just in the US, but globally, as it has three fields all with excellently maintained turf wickets. Such is it’s standing that Woodley hosted the World Cricket League Division 4 in fall of 2016 when the USA hosted Bermuda, Denmark, Italy, and Jersey. 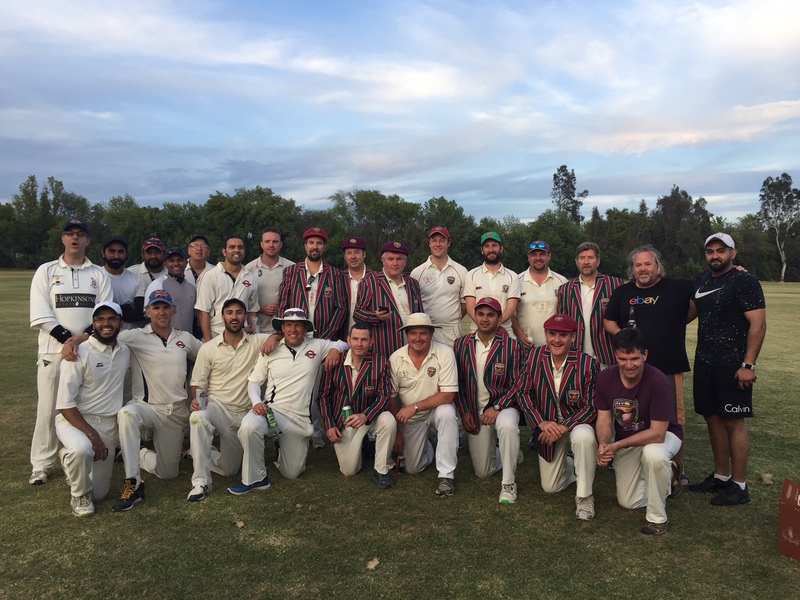 NVCC were hosted on their trip south by Malibu CC and the match at Woodley was played in excellent spirits with social cricket to the fore. NVCC Tour Captain Paul Armbruster gave everyone a bowling opportunity on the magnificent surface while social rules “retirements” at 30 runs allowed the match to stay competitive. 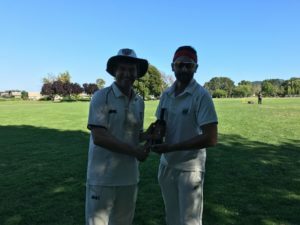 Pick of the bowlers for NVCC was club President Rob Bolch who picked up two tail end wickets while there was one wicket apiece for Grewal, Tim Kay, and Pete Carson. With Malibu CC setting a total of 176 in their 30 overs NVCC were hoping to break their hoodoo of never having won on tour, with this being their sixth attempt. Openers Bolch (2 off 20) and Englishman Clive Richardson (0 off 3) tried, but failed, in the face of some pretty stiff bowling and Maqsood (1 off 10) also failed with the bat. Another fine batting display from Grewal (31 off 34) who alongside Kay (12 off 25) and Jake Radloff (28 off 29) dragged NVCC back into the match and at the 15 over drinks break they were neck and neck on runs scored. Grewal’s retirement and the fall of Radloff’s wicket took the steam out of the chase and despite more good batting down the order from Pete Sander (19 off 18) and Helme (13 off 10) NVCC ended up with 132 from their 30 overs, falling short once again on tour. NVCC renewed their annual rivalry with the Marin CC Social at Piper Park Larkspur on a hot Saturday recently. The clubs have a three-match series (two in Marin, one in Napa) that they play annually and NVCC have been victorious in the series for the last two seasons. However, Marin managed to turn the tables in the first-of-three series for 2018 in what turned out to be an intriguing, low scoring match, where the result was in doubt until almost the final over. Asked to bat first by Marin NVCC lost a spate of early wickets cheaply with opener Jeff Keene (13 off 45) the only one of the early batsmen who could look at their contribution with any sort of satisfaction. Martin Mackenzie (0 off 5), Leigh Ritchie (4 off 4), Singh (2 off 11) all went early and it took Beveridge to join Keene in the middle and steady the falling wickets. The pair added 32 runs for the fourth wicket with Beveridge adding 19 off 27 until he played and missed at a beautiful swinging ball from Marin’s Arvind Krishnan. Next ball Krishnan bowled the in-form Grewal with a stunning ball that swung and moved off the seam to remove Grewal’s middle stump while Keene looked on helplessly from the other end. The hat-trick ball brought Joshua to the crease and while he survived his first ball faced he only managed to add eight runs from 35 balls. A strong, and watchful, innings from Helme (27 off 66) helped boost the NVCC total while 10 off 12 right at the end of the innings from Club Captain Bernie Peacock helped NVCC over the magic 100 run mark in their 40 overs. Marin’s chase was slow and methodical with plenty of chances for NVCC to defend their relatively low total of 106. Peacock used his pace attack to great effect early on and then shuffled between his medium-pacers and spinners. Marin lost wickets regularly while they were staying in touch with the required run rate of just under three an over. Five maiden overs (no runs scored) from Grewal (three) and Helme (two) kept the pressure on Marin and while they had plenty of overs to bat it out they only managed to reach their target in the 38th over, thanks mainly to a knock of 26 runs off 46 balls from Nikin Patel. Clos du Val, Amcor, Anchor Brewing, Bill Wagner Realtor, Balanced Business Group, Caliber Home Loans, Compadres Rio Grille, Crown Hill Stone Supply, John Fearless, St. Helena Optometry, Seguin Moreau, Southside Café, TRICOR Braun WinePak, ZAM Apps, 19 Crimes Wine, Aroma Restaurant, AZMERA Consulting, Blue Jean Black Design, Left Coast Wine Packaging, Napa Gourmet Foods, Stone Universe International, 3 rock marketing.